Dwarf lake iris (iris lacustris); photo by Kristin Maling on Flickr (noncommercial use permitted with attribution / no derivative works). This unique and rare wildflower is found only on the coastlines of northern Lake Michigan and northern and eastern Lake Huron, one small site on the southern shore of Lake Superior, and a few isolated islands of the Great Lakes (it thrives in low wet spots near beaches, not on them). Listed as endangered, this iris is much smaller than other iris (growing only 6-8 inches tall). 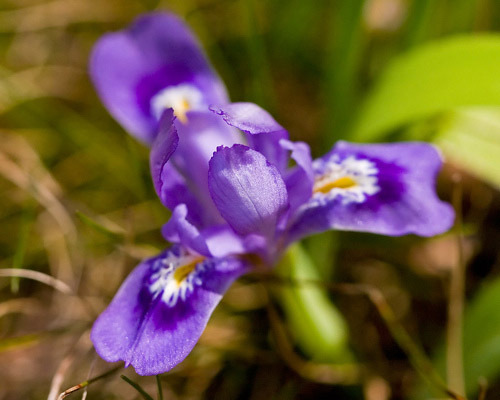 The dwarf lake iris has a flower only 1.5 - 2 inches in diameter and blooms for only about one week during the year (the flower is almost always purple in color, with an occasional white mutant).